Mayzent FDA approval : The US Food and Drug Administration (FDA) has approved Swiss pharma company Novartis’ Mayzent (siponimod) for the treatment of relapsing forms of multiple sclerosis (MS) in adults. The latest FDA approved Novartis MS drug can now be used for the treatment of secondary progressive multiple sclerosis (SPMS) with active disease, relapsing-remitting multiple sclerosis (RRMS) as well as clinically isolated syndrome (CIS). Multiple Sclerosis is a chronic inflammatory autoimmune disease of the central nervous system and is considered to be the most common cause of neurological disability in young people. Mayzent is a sphingosine 1-phosphate receptor modulator that binds selectively to S1P1 and S1P5 receptors. For the S1P1 receptor, it blocks the lymphocytes from egressing the lymph nodes and as a result, from entering the CNS of MS patients, thereby leading to anti-inflammatory effects of the drug. 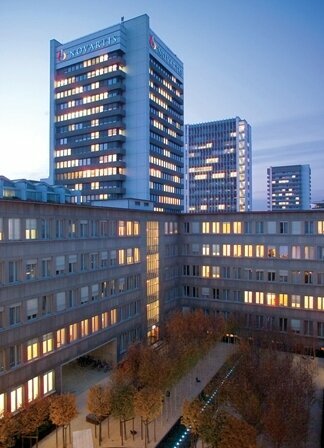 Novartis secures Mayzent FDA approval for relapsing forms of MS. Photo courtesy of Novartis AG. Mayzent FDA approval has been driven by data from a phase 3 trial called EXPAND, which compared the efficacy and safety of the Novartis MS drug against placebo in people living with secondary progressive multiple sclerosis. The EXPAND clinical trial featured 1,651 SPMS who had evidence of disability progression in the prior two years and had no relapse in the three months prior to their enrollment. The primary endpoint of the EXPAND clinical trial was the time taken to three-month confirmed progression in disability. The ratio of SPMS patients with confirmed progression of disability was significantly lower in the Mayzent arm compared to what was seen in the placebo group. The number of relapses faced by the patients was also lowered in the Mayzent arm. The results were not significant statistically in the subgroup of patients with non-active SPMS. Paul Hudson – CEO of Novartis Pharmaceuticals, commenting on Mayzent FDA approval, said: “One of the most important aims of MS treatment is delaying disability progression and preserving cognition. “With Mayzent, SPMS patients with active disease will have access to the first effective oral therapy directed towards disease progression, even when MS transitions to a stage where deterioration is less dependent on the usual relapse activity. For more pharma regulatory news like Mayzent FDA approval, keep following PharmaNewsDaily.com.